"Therefore, having this ministry, as we have had mercy shewn us, we faint not. But we have rejected the hidden things of shame, not walking in deceit, nor falsifying the word of God, but by manifestation of the truth commending ourselves to every conscience of men before God. But if also our gospel is veiled, it is veiled in those that are lost; in whom the god of this world has blinded the thoughts of the unbelieving, so that the radiancy of the glad tidings of the glory of the Christ, who is the image of God, should not shine forth for them. For we do not preach ourselves, but Christ Jesus Lord, and ourselves your bondmen for Jesus' sake. Because it is the God who spoke that out of darkness light should shine who has shone in our hearts for the shining forth of the knowledge of the glory of God in the face of Jesus Christ. "But we have this treasure in earthen vessels, that the surpassingness of the power may be of God, and not from us: every way afflicted, but not straitened; seeing no apparent issue, but our way not entirely shut up; persecuted, but not abandoned; cast down, but not destroyed; always bearing about in the body the dying of Jesus, that the life also of Jesus may be manifested in our body; for we who live are always delivered unto death on account of Jesus, that the life also of Jesus may be manifested in our mortal flesh; so that death works in us, but life in you." 2 Corinthians 4:1-12. "Dost thou not know, hast thou not heard, that the everlasting God, Jehovah, the Creator of the ends of the earth, fainteth not nor tireth? There is no searching of his understanding. He giveth power to the faint; and to him that hath no might he increaseth strength. Even the youths shall faint and shall tire, and the young men shall stumble and fall; but they that wait upon Jehovah shall renew their strength: they shall mount up with wings as eagles; they shall run, and not tire; they shall walk, and not faint." Isaiah 40:28-31. I have an impression concerning these two passages that I trust will encourage us, dear brethren. Both of these passages refer to fainting – in second Corinthians 4, "... having this ministry, as we have had mercy shown us, we faint not", and in Isaiah 40, "He giveth power to the faint". And these scriptures teach us that God ministers and gives power to those who trust in Him. God's power is available to believers who are going through intense persecution and affliction and discouragement. I trust that we are all conscious of the truth of this first verse of 2nd Corinthians 4: "As we have had mercy shown us, we faint not". We have all had mercy shown us. And I believe we are all conscious of God's power by the Holy Spirit indwelling us. This chapter states, "We have this treasure in earthen vessels". 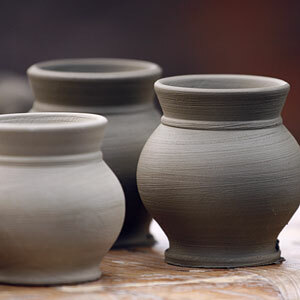 Well, an earthen vessel is the lowliest form of vessel. It is the last of those mentioned in second Timothy 2: "gold and silver", "wooden and earthen". Those are the four materials of which vessels are made in 2nd Timothy chapter 2, and there is a certain order in those vessels. The gold vessels are the most precious, and then the silver, and then the wooden, and finally the earthen. Paul writes here that we have this treasure in earthen vessels. I trust we are all conscious of being earthen vessels – persons to whom mercy has been shown. But despite the lowly character of the vessel, Paul writes "that the surpassingness of the power may be of God, and not from us". He writes elsewhere, "When I am weak, then I am powerful", showing that, as we realize the utter incapacity of our own frail human vessel to accomplish anything for God, God then comes in with His own power as we turn to Him in dependence and humility. So these are the conditions of which Paul writes: "Every way afflicted", "seeing no apparent issue", "persecuted", "cast down", "always bearing about in the body the dying of Jesus". Well, that is how it looks outwardly, doesn't it? That is the way that things seem outwardly, but then there is what's inward, because the treasure is inside the earthen vessel: "but not straitened", "but our way not entirely shut up", "but not abandoned", "but not destroyed", "that the life also of Jesus may be manifested in our body". These all relate to the treasure that we have inside our earthen vessels – the consciousness of God's power: "that the surpassingness of the power may be of God, and not from us". So that, in conditions of affliction, persecution, of bearing about in the body the dying of Jesus, we can have a sense of joy and power. "Not straitened". Straitened refers to something very narrow, a very small and restricted area of things, but inside "not straitened"! A suffering believer can have a conscious sense that he is not straitened. Then he says, "but our way not entirely shut up". Paul writes of being caught up to the third heaven, and think of what opened up to him in that heavenly realm! John was on the island of Patmos, in exile, but what a revelation came to him – the manifestation of the Lord Jesus and "the things which must take place after these things". Paul writes of his experience, "that I might not be exalted by the greatness of the revelation". And then we have "not abandoned". The Lord Jesus says, "I will not leave you orphans". So Paul writes, similarly, "but not abandoned". And then "cast down, but not destroyed". Jesus says, "The thief comes not but that he may steal, and kill, and destroy: I am come that they might have life and might have it abundantly." John 10:10. So how precious are these expressions: "that the life also of Jesus may be manifested in our body" and "that the life also of Jesus may be manifested in our mortal flesh". Our mortal flesh is an earthen vessel – it is made of dust, and unto dust it shall return. But the life of Jesus is to be manifested in our mortal flesh! How remarkable it is that in these frail, human vessels the life of Jesus can be manifested! In Isaiah chapter 40, we read that "he giveth power to the faint, and to him that hath no might he increaseth strength". We can link this with what the apostle Paul writes about persecuted and afflicted persons. It says, "Even the youths shall faint and shall tire, and the young men shall stumble and fall". That is what you'd see outwardly. But then as we wait on Jehovah, "they that wait upon Jehovah shall renew their strength." Isaiah is writing of the power of the Holy Spirit! "They shall mount up with wings as eagles; they shall run and not tire; they shall walk and not faint." John writes in his first epistle, "Greater is he that is in you than he that is in the world" (1 John 4:4). And he writes of young men having overcome the wicked one! Well, the power for overcoming is available in the Spirit of God. In the book of Revelation, the Lord speaks so attractively to the overcomer in each of those seven assemblies, and I believe that we have the overcomer here in Isaiah 40. "They that wait upon Jehovah shall renew their strength". It is not something that we do in our own strength, not something we do in our own natural power, but it is persons who are conscious that they are waiting on God, simply dependent on God, and such persons find that the Holy Spirit gives them power to go on. I believe the Holy Spirit would help us day by day to go on, as renewing our strength. "They that wait upon Jehovah shall renew their strength". Perhaps we sometimes feel a bit discouraged, but as we wait on Jehovah, we'll find that He will renew our strength. What a cause for rejoicing – that there is power to sustain us in the testimony of our Lord and Savior Jesus Christ! So that we can "Run, and not tire", "walk, and not faint". Galatians 6:9 reads, "Let us not lose heart in doing good, for in due time, if we do not faint, we shall reap". And the power for not fainting is available in the Spirit of God. May we make room for the Spirit and have this power within us. The surpassingness of the power is of God, not from ourselves. Warren Township, New Jersey, USA. Showers of Blessing - my Christian ministry. 1 Corinthians 14:26.